The 2018 Export Exchange starts next week in Minneapolis, but many teams of international buyers are already here in the United States participating in pre-event tours around the Midwest. The tours include three teams from Mexico who will visit Kansas, Oklahoma, Nebraska, Kentucky and Iowa to see U.S. corn, sorghum and distiller’s dried grains with solubles (DDGS) production and supply as well as assess current crop conditions during their stops. Two teams are visiting states before Export Exchange and one will be visiting after the event concludes. In addition, a trade team interested in corn and DDGS from Vietnam will visit Illinois after participating in Export Exchange. 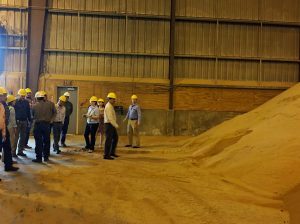 While in Illinois, the Vietnamese party will engage in specialized crop tours of the 2018 corn harvest, as well as visit an ethanol plant and trans-loading facility. Export Exchange is a biennial educational and trade forum for U.S. feed grains sponsored by the U.S. Grains Council (USGC), the Renewable Fuels Association (RFA) and Growth Energy that will host approximately 200 international buyers and end-users organized into 21 USGC trade teams. It will be held Oct. 22-24 in Minneapolis.